DC’s massive “Rebirth” event kicks off this week with the arrival of the Geoff Johns-penned DC UNIVERSE: REBIRTH. Are you ready? Let me say it again, ARE YOU READY?!?! But I'm getting myself ready! While the three stories aren’t direct continuations of each other, I don’t feel like I’ll be fully prepared for DC Universe: Rebirth until I’ve finished reading Geoff Johns and Ethan Van Sciver’s prior two “Rebirth” comics, GREEN LANTERN: REBIRTH and THE FLASH: REBIRTH. I made my way through Green Lantern last week, which I encourage you to go check out, particularly if you’re up for reading along. Now it’s the Flash’s turn, and I couldn’t be more revved to go. I should admit that I’m a big fan of FLASHPOINT, Geoff Johns’ later Flash event that kicked off The New 52, so it’s kind of ridiculous that I’ve never read The Flash: Rebirth. Well, all that changes right now. If you also haven’t read this classic miniseries, it’s a great time to read through it with me. Its six chapters are currently all on sale for ONE MORE DAY as a part of the Road to Rebirth Digital Sale. Go grab them now, even if you don’t have time to read them today. Trust me, you’re not going to find a better deal. Of course, if you have read it, by all means, share your thoughts and opinions in the comments down below. Discussion is always welcome and it’ll help us pass the time till Wednesday. All right, let’s get started. Slight spoilers may lay ahead. Reading The Flash: Rebirth immediately after finishing Green Lantern: Rebirth certainly allows you to appreciate the differences between the two, the biggest being that unlike in Hal’s “Rebirth” title, The Flash: Rebirth doesn’t actually restore Barry Allen to life. That was done in Grant Morrison’s FINAL CRISIS. The Flash: Rebirth was published after that to once again establish Barry Allen as The Flash proper within the DC Universe. That immediately changes the tone and type of story we’re getting here and I’m fascinated to see where the following five chapters are heading. Also of immediate note, Ethan Van Sciver’s art looks AMAZING. It was great in Green Lantern: Rebirth, but I think you can really see the five years of growth as an artist he’d had between the two projects. The opening prologue shown from an as-yet-unseen villain’s point of view is comic storytelling at its strongest. Okay, let’s see what happens in Chapter 2! While Hal’s story was about bringing the former Green Lantern back, Barry’s so far seems to be about the complications that arise when he returns, and those complications seem to take many forms. There’s everything that Barry’s return brings to the lives of his friends and family. What does he return mean for Iris? For Wally? For the Justice League? How do you explain the sudden reappearance of his civilian identity? And of course, there’s the as-yet-unexplained disruption that his return has brought to the Speed Force, which seems to suddenly be hurting—and in some cases killing—the world’s other speedsters. I really appreciated the flashback scene in this chapter showing how Barry first met Iris. It’s just a brief moment in the comic, but I feel like it says so much about who Barry was compared to who he has become since meeting her and gaining his powers. Johns just excels at these kinds of character moments, so I’m always glad when he includes them in a story. You know, as cool as the Speed Force is, it doesn’t seem like a fun place to be trapped in. Especially now that it’s become toxic. As someone with no artistic ability whatsoever, it doesn’t take too much to impress me as far as comic art goes. But I’ve always been particularly blown away by artists who successfully render abstruse fictional concepts, whether it’s the otherworldly realms of Swamp Thing, the magical concepts of Constantine or Zatanna, or in this case, the Speed Force. It’s easy enough for us writers to say, “the Flash races back through time, getting glimpses of his past, as he enters the Speed Force,” but it’s an artist who has to visualize that into something that will make sense to readers while still being appropriately mind-blowing. So kudos to Van Sciver for pulling off just that. The sequence in this chapter where a desperate Barry Allen races through his own history as he attempts to hold onto his wife’s name is an absolute stunner. There’s so much going on here and not once was I lost. In fact, it wasn’t until I’d finished it that I was able take a step back and realize how “out there” this whole chapter was because it just didn’t read like it. It starts with Barry realizing he’s become the Black Flash and brings death to any speedster he touches, moves on to the Justice League’s attempt to sever him from the Speed Force and finally erupts into Barry taking things into his own hands (legs?) and running back into the Speed Force. And that’s to say nothing about the craziness we witness when he gets there! One last realization. I’d completely forgotten the fact that this story takes place after Batman’s death in Final Crisis. It wasn’t until Superman mentioned losing him that I remembered where in the DCU’s timeline we are here. It’s a shame. You know he’d have an interesting perspective on Barry’s return and the danger he now seems to represent to many of his fellow heroes. All right, let’s see what the Reverse-Flash is up to! This “Rebirth” story is not just about Barry’s return to the DCU (as we discussed, that actually doesn’t even occur in this book), it’s about seeing him come to understand his importance to the world of the Flash and the entire DCU. For the character, it’s a conceptual rebirth as much as it’s a physical one. 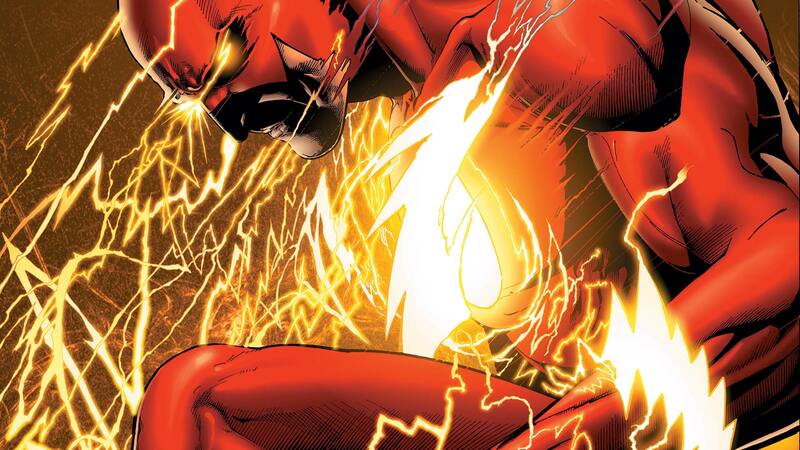 We’re learning why Barry matters in a comic universe where there are at least three other Flashes and plenty of other heroes beyond that who tap into the Speed Force. Barry’s not just one of the Flashes, he is literally the heart and soul of this world. He’s the Flash from which everything was built, both within the story (Barry created the Speed Force when he was struck by lightning) and behind it (he kicked off the Silver Age of Comics). It’s fascinating stuff for longtime Flash readers. That said, with how much this story relies on awareness of the Flash’s universe and some of its less straightforward elements, I could see how this story might be challenging for brand new readers. I don’t think I’d suggest The Flash: Rebirth as someone’s first Flash comic. While I think readers interested in Green Lantern would do well to start with Green Lantern: Rebirth, I think your understanding of this one depends on having some sort of awareness of what’s come before. Just my two cents! Let’s move on to Chapter 5! A thrilling speed battle punctuated by cool moments of revelation and insight. With so much action and less dialog than prior chapters, you’d expect this one to go quickly, and yet I think it took me longer to get through this chapter than many of the others. I think that’s because the Flash’s fights are always so unique and visual. With Batman and even Superman and Wonder Woman, you kind of know what you’re going to get as far as fights go. But with the Flash and all the different ways he can use his abilities, there are a lot more surprises. Especially when he’s teaming up with the other speedsters. While a super hero’s life is often solitary, it surprisingly never occurred to me that the Flash literally cannot interact with other people when he’s using his powers. He’s not the only hero who has that handicap—and it is a handicap, albeit a subtle one—but he’s certainly the only member of DC’s top tier that possesses it. Pretty big spoiler here if you haven’t read The Flash: Rebirth, but this is also the chapter where you learn that the Reverse-Flash murdered Barry’s mother, a storyline which the CW series adapted for its first season. I’m a huge fan of the show and a regular viewer, and it’s pretty cool finally getting to read the comic book inspiration for that. All right, let’s see Barry lay the smackdown on Thawne. The faster you run, the more brutal the crash, right? One thing that I’ve always appreciated about Johns’ writing is that as complex and broad as his stories can get, their endings always manage to feel natural, earned and refreshingly straightforward. That was very much the case in Green Lantern: Rebirth, and it also exists here. With all of the philosophizing about the Speed Force and the complicated relationship between the Flash and Reverse-Flash, The Flash: Rebirth ends with Barry and Wally—the man who’s been shouldering the mantle of the Flash and the man who will inherit it once again after this story has concluded—teaming up to save Iris and take down the Reverse-Flash. It’s a team-up that Flash fans needed to see for this evolution to work, and Johns and Van Sciver see it through to perfection. I think this chapter represents Van Sciver’s strongest work in this series. Expertly balancing electric races back in time with real-world moments from Barry’s past, it keeps the stakes real even though the battle is pure comic book craziness. I particularly appreciated the panel below, showing Thawne right after he’s been cut off from the Negative Speed Force, that’s so clearly meant as an homage to the Flash’s demise in CRISIS ON INFINITE EARTHS. In fact, I might have actually yelped and clapped out loud when I saw it. I might have. You’ll have to ask my officemates. Overall, I was once again impressed with the creativity on display here. The book really sheds some more light on what the Speed Force is, once again reminding us of how important for comics it was—both as a collection of stories and as a beloved medium—the moment that Barry Allen became the Flash. Also, to clearly see the seeds planted here for what would eventually become FLASHPOINT reveals a long game that you can’t help but be impressed by. The actions of Barry and Thawne in that later series seem to carry so much more weight now that I’ve read this book. In fact, I may just go back and reread that next. Thanks again for going on this journey with me. Remember, you’re not only welcome to leave your thoughts on The Flash: Rebirth below, I encourage you to! I’d love to get some other perspectives, both now and after you’ve read DC Universe: Rebirth when it’s released on Wednesday. Speaking of DC Universe: Rebirth, while I won’t be doing a readthrough of that series here on DCComics.com, you can certainly look for plenty of follow-up features on it once it’s in stores, so be sure to drop by a bit later this week for that. Until then, take care and keep running…and reading. THE RETURN OF A LONG-LOST FLASH TO THE DC UNIVERSE!